Big Time Bats is proud to release this exclusive David Ortiz Game Model Marucci Bat in honor of his #34 jersey retirement by the Boston Red Sox. The bat comes with a special engraving with the ceremony information and acknowledgment of Ortiz’s all-time records as a designated hitter. With exclusive technology, the bat will feature the reproduced artwork of renowned sports artist Jolene Jessie. 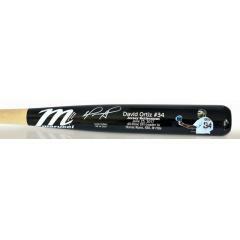 Ortiz will be personally signing each bat with his signature coming fully authenticated by Fanatics. Ortiz is arguably the most popular athlete in Boston sports history. He was part of the Red Sox team that broke the “Curse of the Bambino” in 2004. He went on to win two additional World Series titles and was the 2013 World Series MVP. Ortiz finished his career as a 10x All-Star, 7x Silver Slugger, and is the all-time DH leader in home runs, RBI, and runs. Get your player model bat before they sell out! Due to the limited nature of his offer we must charge your credit card for the full price immediately upon taking your order. This policy ensure we reserve a bat for you. We will confirm your order by email. This bat is not game used. Please allow 4 to 6 weeks for delivery.